Dear Saint Cecilia, one thing we know for certain about you is that you became a heroic martyr in fidelity to your divine Bridegroom. We do not know that you were a musician but we are told that you heard Angels sing. Inspire musicians to gladden the hearts of people by filling the air with God’s gift of music and reminding them of the divine Musician who created all beauty. Amen. Her feast day is November 22. Saint Cecilia is said to have heard heavenly music inside her heart when she was forced to marry the pagan, Valerian. A wealth of music, art and festivals in honor of St. Cecilia has grown from this little bit of information from her biography. 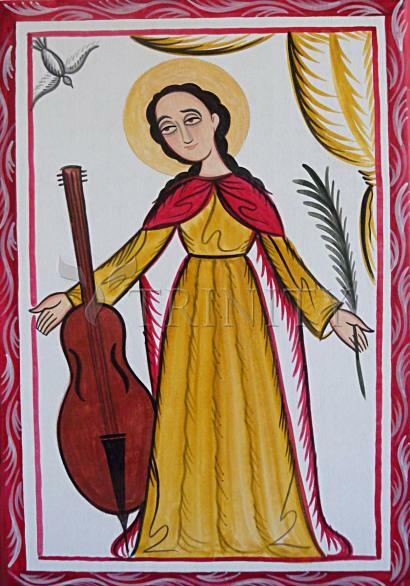 She is the acclaimed patron saint of music, especially church music, as well as that of musicians, composers, instrument makers and poets. The name Cecilia means blind and so, although we don't know if she herself couldn't see, she is also the Catholic patron saint of the blind. It is believed that St. Cecilia was born in the 2nd or 3d century A.D., although the dates of her birth and martyrdom are unknown. A religious romance telling the love story of Saint Cecilia and Valerian appeared in Greece during the 4th century A.D., and there is a biography of St Cecilia dating from the 5th century A.D. She is purported to have been the daughter of a wealthy Roman family, a Christian from birth, who was promised in marriage to a pagan named Valerian. Cecilia, however, had vowed her virginity to God, and wore sackcloth, fasted and prayed in hopes of keeping this promise. Saint Cecilia disclosed her wishes to her husband on their wedding night. She told Valerian that an angel watched over her to guard her purity. He wanted to see the angel, so St. Cecilia sent him to Pope Urban (223-230). Accounts of how and when Valerian saw the angel vary, but one states that he was baptized by the Pope, and, upon his return to Saint Cecilia, they were both given heavenly crowns by an angel. Another version recounts that Tibertius, Valerian's brother, sees the crowns and he too is converted. The two brothers then make it their mission to bury Christian martyrs put to death by the prefect of the city. In turn, they were brought in front of the prefect and sentenced to death by the sword. Cecilia, in the meantime, continued to make many conversions, and prepared to have her home preserved as a church at her death. Finally, she too was arrested and brought before the prefect. He ruled that she should die by suffocation in the baths. Saint Cecilia was locked into the bathhouse and the fires vigorously stoked. She remained there for a day and a night but was still alive when the soldiers opened the doors. She was then ordered beheaded, but the executioner, after striking three times without severing St Cecilia's head, ran away, leaving her badly wounded. St. Cecilia hung onto life for three days after the mortal blows, preaching all the while. She made many more conversions and people came to soak up her flowing blood with sponges and cloths. There exists in Rome a church in St. Cecilia's honor that dates from about the fifth century. Her relics were believed to have been found by Pope Paschal I in 821 A.D., in the cemetery of St. Celestas. These remains were exhumed in 1599, when Cardinal Paul Emilius Sfondrati rebuilt the church of St. Cecilia, and said to be incorrupt. St. Cecilia's following flourished during the Middle Ages in Europe. Songs were sung in her name, poetry was written, paintings with St. Cecilia as the subject were created, and her feast day, on November 22 was happily celebrated. She continued to be a popular topic for the arts well into the 18th century. Hans Memling, in 1470, painted St. Cecilia playing the organ at the mystical marriage of Catherine of Alexandria. In 1584 she was named patroness of the academy of music founded in Rome. Raphael painted her at Bologna, Rubens at Berlin and Domenichino in Paris. Chaucer commemorates her in his Second Nun's Tale and Handel set John Dryden's "Ode to Saint Cecilia" to music in 1736. Never was so much made of such a tiny bit of pseudo-biographical information. St. Cecilia, said to have heard heavenly music at one moment of her life, became the patroness of all western music. Even the Andrews sisters, in 1941, recorded a song, "The Shrine of St. Cecilia."